First of all, I’m not a train nut. I don’t wear an anorak and stand in the rain at the end of railway platforms and scribble down passing train numbers in a cheap notebook with a blunt stubby pencil while peering myopically through my rain splattered specs and wondering if my jam sandwich is too soggy to eat and if that wet patch on my leg is the rain or has my feckin’ flask leaked again. No, absolutely not. I do have an anorak, an arctic one no less, though but I prefer to call it a parka and I do wear specs but they’re rimless and cool. And varifocals, to boot, with a funky antireflection thingy. Really cool. OK! OK?? In a few months, I’ll be travelling over forty five thousand kilometres from Dublin to and around Russia and then to Mongolia, China, Central Asia, the Caucasus, Iran and Turkey and then western Europe again back to Dublin. I’ll be doing nearly the whole journey by train except on the few occasions where this is not possible. I’ll catch a ferry from Ireland to the UK, one across the Caspian sea from Kazakhstan to Azerbaijaan and possible a few coaches in Iran and Turkey should I decide to travel away from the main areas. Historically, civilisation and human growth has frequently expanded along transport lines such as ports and rivers and more recently along railway lines. 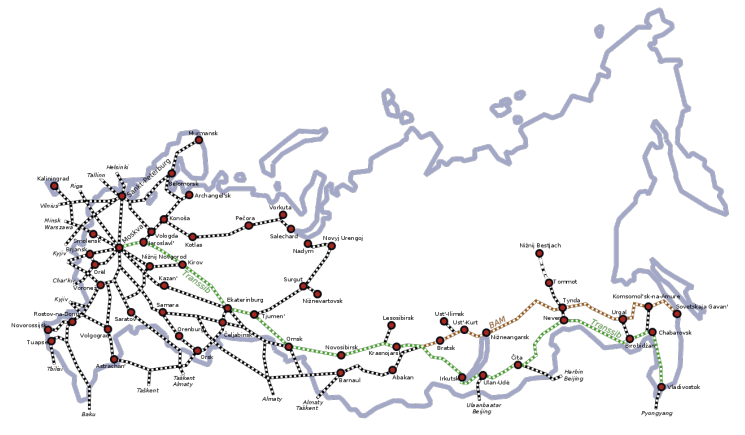 There are many distant areas in Russia that exist only because of the railway lines so using train to travel around Russia and China and indeed around most of Central Asia would seem to me a good way to maximise the efficiency of my traveltime. Another huge advantage of train travel is that it is fairly comfortable. The thought of having to use car, minibus, coach or, horror of horrors, an aeroplane to travel these distances does not appeal to me at all. The idea of being stuck in an uncomfortable seat for many hours just doesn’t work for me. Trains are different in that it’s possible to get up and walk around and there is generally quite a lot of space. If you look at my itinerary link here you will notice that there are several long journeys over over 12 hours or so and some are even a couple of days in length. For these journeys I will be travelling in sleeper carriage. 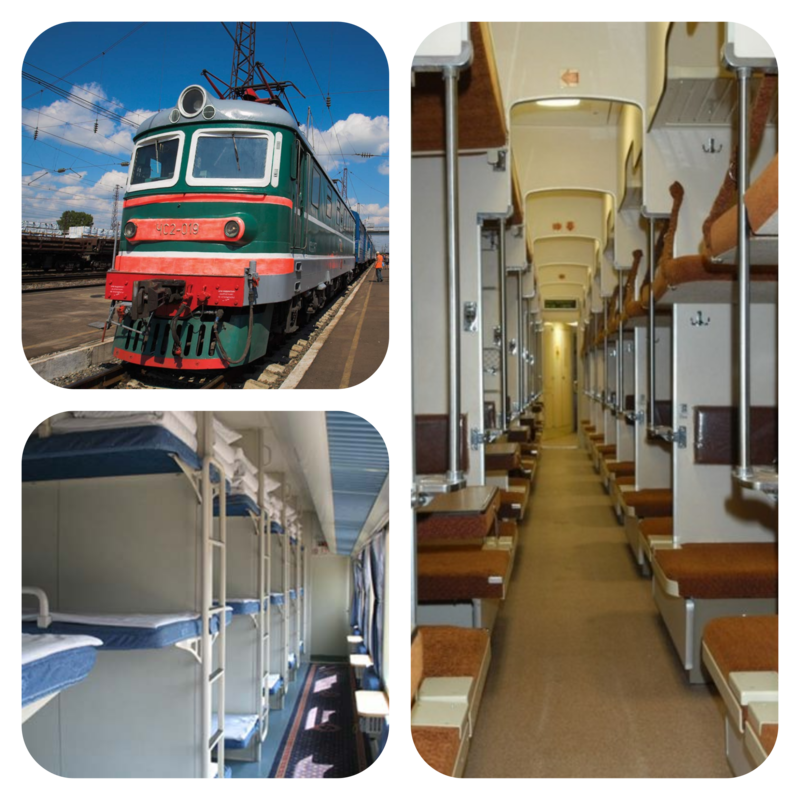 Most of the Russian and Chinese trains and indeed nearly all the trains in Asia have three main sleeper compartments. 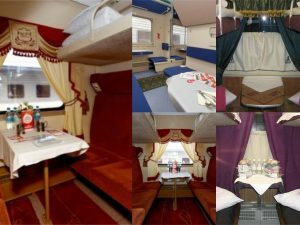 The first one is, naturally enough, called first class and consists of a carriage with just two bunks that convert into beds at night. During the day you can sit down and look out the window. They are pretty comfortable depending on the type and the age of the train etc but nearly all have a locked door so there is a sense of security. I would not use them as they’re a bit pricey. The second type is what’s called in Russian a kupe or soft sleeper through China and most of Asia. 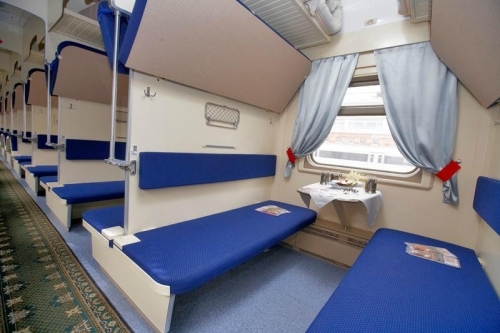 This is similar to first class except there are four bunks instead of two. During daytime the top berths are folded up and the lower berth can be used as ordinary seats. 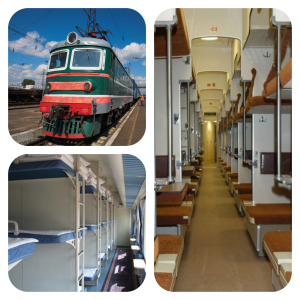 I’ve travelled many thousands of kilometres on these carriages throughout Southeast Asia and they were perfect for long distance travelling. There was a sense of privacy but also a chance to meet people love the people. The third type, strangely enough, is called third class. This class is called Platzkart or Hard Sleeper. There is a single carriage with a round 55 or so bunks so it can get very crowded. I traveled in a few of these carriages in Malaysia and Vietnam on fairly short overnight journeys, less than 30hrs, and they were perfectly adequate. Second class is about half the price of first class and third class is about half second class price so travelling second class would make good financial sense. I will be using a UK travel agency with offices all over Russia to buy all my tickets for Russia, Mongolia, China and central Asia as well as the Caucuses. I could do this myself but they have far more experience in getting to grips with the arcane booking system in Asia. More importantly, they will also be able to spot any inconsistencies in my itinerary and advise me how to change it. They will charge me about 10% to do this but as fares are extremely low, it’s worth every cent. On top of that, they provide a visa service so I can get everything done in one place. They also have a mobile sim that can be used in all the countries I will be traveling through. They have a 24-hour 7-day concierge and translation service so if I’m stuck somewhere and need to communicate with police or border security people or even in a hotel or tourist spot, I just need to phone this free phone number and they will translate want I to say and what is being said to me. Based on my experience of travelling is SE Asia, this will be invaluable. 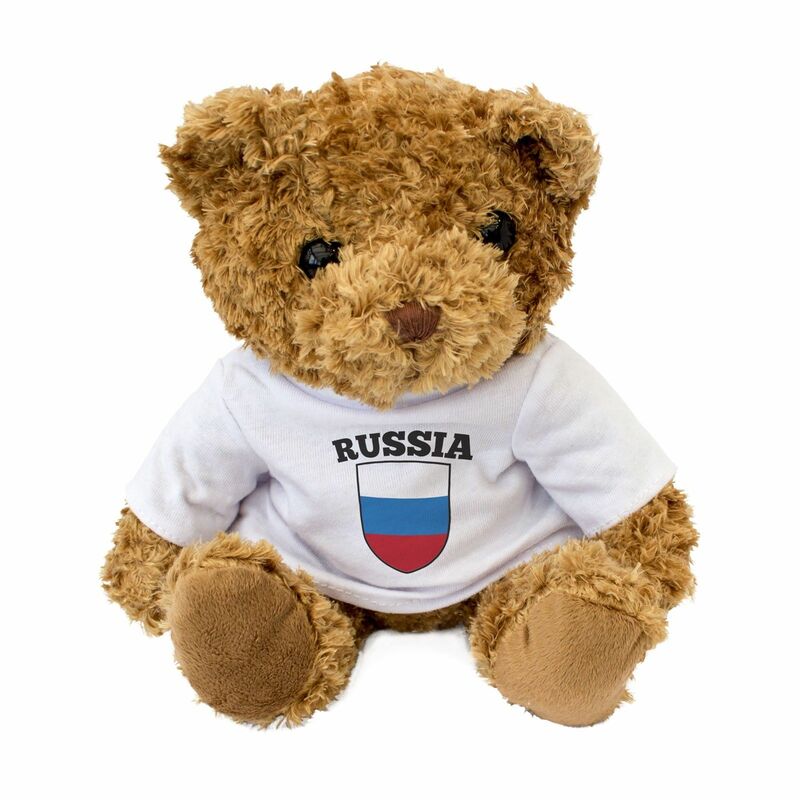 The company is called Real Russia. Another thing I like about travelling by train is that when you’re on a long journey it’s like being in a liminal space where you have left one place, you have departed from one place, and you haven’t arrived at the next place and you’re in this no man’s land where you have to relinquish control and and just let what needs to happen, happen. I like this. It’s also an opportunity to meet people. I had really good contact with people on trains in Southeast Asia who hardly speak any English and I spoke hardly any of their language, just a few words of Cantonese and none of Mandarin. Yes we managed to communicate and it was very endearing how they looked out for me and make sure I got food and water etc. I wonder what it would be like for a Chinese or Thai person travelling on train in Ireland or indeed anywhere in Europe. I doubt very much if they would experience anything like the hospitality and kindness I experienced nearly all the time from locals in Asia. More likely than not, they would be viewed with suspicion as ‘immigrants’ coming over here to take something from ‘us’; such is the power of engineered fear. Russia alone has over 85,000km of railway tracks and China has almost 70,000km. I intend to make serious inroads into them! My main worry about travelling in Russia, central Asia and the Caucasus is the predominance of Vodka. 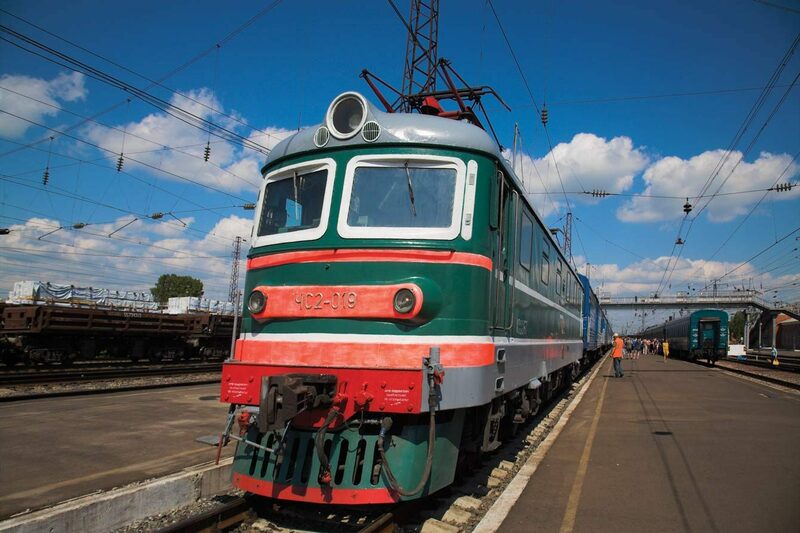 One of the trains I’ll be travelling on for almost 10,000km, the Trans-Siberian Railway, is dubbed ‘the vodka train’. WtF, as the young ‘uns say. Not that I’m afraid of drinking. I recently celebrated 35 years of continuous sobriety so my recovery is strong than Wolverine’s claws. Instead, It’s unlikely that I’ll ever drink again. Picking up a drink or a drug would be the end of a relapse and I would catch it long before it became a problem. That’s the nature of long-term recovery. Neither am I worried about hurting peoples feelings because I refuse a drink from a local. I’ll be visiting some really out of the way places where tourists rarely go so it’s possible local people will be hospitable. From what I read about Russia, vodka seems central to the Russian sense of hospitality. 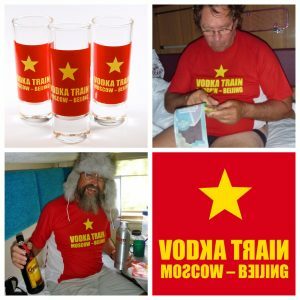 The vodka train will be top of the list here. I’ll have a strategy where I can say no without causing offence. Of course I don’t want to cause offence. I haven’t worked out exactly what this strategy will be but it will be convincing. It will probably combine an imaginary illness with prodigious lying. I’ll make sure I have a Russian language version polished up for the trip. I have this great app on my phone, Google Translate. I dictate something into the phone and it immediately translates it into one of a hundred languages and then speaks the translation in the chosen language. Perfect for awkward moments where language is a barrier. It even saves phrases so a few taps on the screen and communication takes place. It even allows a 2-way conversation. Genius! No, what concerns me is the apparent degree of drunkenness and rough men with loud voices who might get aggressive or even violent when I refuse to drink with them or spend time with them. I have no patience with drunkenness unless its cute and funny! I’m not good with violence or even aggression. It disturbs and upsets me deeply and brings me back to my traumatic childhood. I used to do judo and karate as a kid and learned self-defence with a gay group many years back. I also trained more recently while working for HM Prison Service but I’ve forgotten a lot of it. I’ve decided to do a self defence course before I go. It a system called Krav Maga and I hear good things about it. My reasoning is that if I appear confident I won’t signal fear and attract predators. I’m also worried about my violent shadow. To date, this is chained up in the basement of my psyche and although we have a relationship, he cannot slip his chains. I don’t fancy spending time in a Russian prison! So, the confidence to walk away would be helpful if grinning like a maniac and talking loudly in Irish doesnt work. That’s it, possums. More later as my plan unfolds. Please comment and any advice or feedback would be greatly appreciated.